OK. The crab spiders are cute, but this one takes it to the next level. 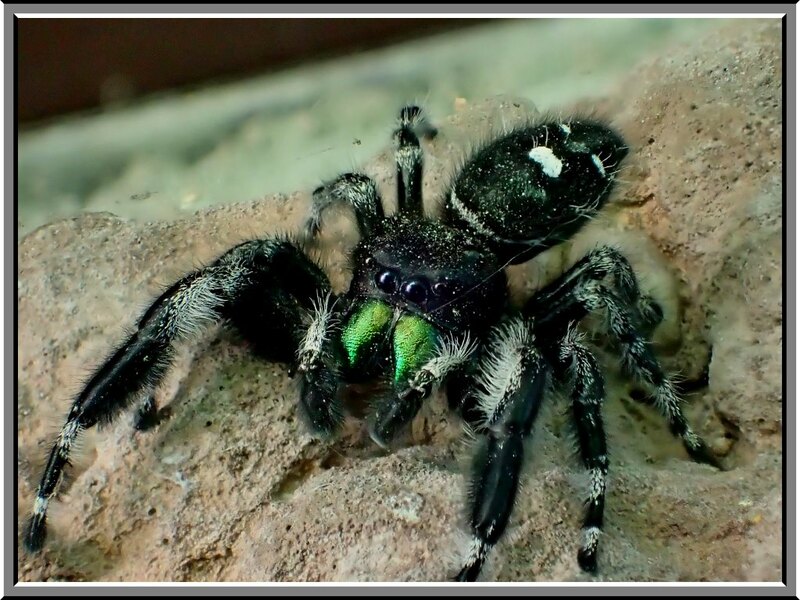 I knew that it was a jumping spider, but now I’ve learned the word for those green parts: chelicerae. Thanks for the new knowledge, and for quite a laugh this early morning! It’s a beautiful creature but it still gives me shivers! But no way am I volunteering to shave those legs! Yes, maybe you can desensitize me! Hope this wasn’t in our house. Somehow it looks like a little puppy. 🙂 Perfect photo, like from a spiders’ realm of cuteness. Very handsome Tom. A real beaut. I’ll just watch, thanks, and leave the wrangling to you, Tom. I wanna EAT your hand hand hand hand hand hand hand?? If you shave those hairy legs, they likely will be pasty white like all of ours from being indoors the last six months or so! Wow you managed to make a spider actually look cute. Your photography is amazing.